1. “Just eat your greens!” Turns out mum was right. According to neurologist Jeff Victorov, leafy greens can help improve attention and are packed with antioxidants that protect against strokes, Parkinson’s and can help fight dementia. If you’re like me and think salads have about as much charisma as Miliband, here are 17 super simple recipes from Huffington Post that’ll take your salads from bland to brilliant. 2. Go nuts. Take a tip from Scrat and store up some brainpower: Nuts and seeds pack a load of nutrients that can seriously boost cognitive performance. A study published in the American Journal of Epidemiology suggests that a good intake of vitamin E might help to prevent cognitive decline and nuts are rich in this vital vitamin, so get cracking (and nibbling). Also, just a handful of pumpkin seeds a day is all you need to get your recommended daily amount of zinc, vital for enhancing memory and thinking skills. 3. Count on coffee. Coffee isn’t craved by most office workers first thing for nothing. I’m glad to report that studies suggest caffeine in an eight-ounce cup of coffee can improve attention and short-term memory. But be careful when gulping down your triple shot espresso, too much coffee can cause restlessness, nervousness, excitement, insomnia, flushed face, diuresis (you keep passing urine), and gastrointestinal disturbance (upset tummy) as this very unfortunate but hilarious story confirms from Buzzfeed. 4. Chocoholic’s delight. I’m also delighted to report that you can go ahead and stuff that double dark chocolate muffin right into your pie-hole! Yes, that’s right, flavonols found in dark chocolate (also found in red wine, green tea, and blueberries) offer a short-term boost in cognitive skills. Dark chocolate also boosts the body’s production of endorphins (happy hormone) and can help to reduce pain and combats the negative affects of stress. So go forth and release your inner Augustus Gloop! 5. Chews gum. Randomly, that stick of Hubba Bubba may be the key to making it through a busy day. Studies have found chewing gum improves mood and alertness and reaction times were quicker, this effect became bigger as the task became more difficult. Chewing gum also improved selective and sustained attention. But be warned, much like tennis elbow, you can get ‘chewer’s jaw’ or temporomandibular joint disorder, which can be a painful chronic condition. Anytime you overuse a certain set of muscles, it can lead to contracted muscles and related pain, including headaches, earaches, and toothaches over time. So next time you’re looking to get hyper focussed at work, grab a dark chocolate fruit and nut bar with a side of spinach and a venti mocha to go. Then tame that coffee breath with a stick of Wrigleys to crank up your productivity. Just be sure you enjoy each of these brain-boosting foods in moderation! These brands are killing it on Twitter and here’s why. I spent much of this weekend watching the RBS 6 Nations and aside from some cracking rugby, I was astounded by the amount of activity on the 6 Nation’s official Twitter account (@RBS_6_Nations) during the matches. I imagine whoever was manning their account was working almost as hard as the players posting every 5 minutes with not just text updates but running commentary accompanied with fully branded photos which were being prolifically shared, favourited and retweeted throughout the matches. RBS 6 Nations account managers obviously gets how to use Twitter. They know their audience is engaged, excited and keen to share content before, during and even after the games. And their posts reflect the immediacy and atmosphere of the day with dynamic photos and bold, snappy headlines. Including an image in your tweets is a good move. According to Adweek, tweets with images receive 18% more clicks, 89% more favourites and 150% more retweets than those without so it’s worth illustrating a tweet if possible. Another brand to take a Twitter masterclass from is, surprisingly, American Airlines. I say surprisingly because airlines generally have a bad rep when it comes to social media self-promotion and customer service responses. The open nature of social media channels means these brands have had to up their game and up it fast to deal with very public customer service complaints. American Airlines don’t have 1.27M followers for no reason. They’ve taken a slightly risky approach to their account which seemed to have paid off in spades. AA’s tweeting is very natural, conversational even and they’ve achieved this by providing their account managers with clear goals and what seems like free reign to post-at-will to meet these objectives. There doesn’t seem to be pre-scheduled tweets or sign-off by committee, it’s natural, it’s human and, importantly, it’s interesting. The human element is important. When it comes to social media, it’s key to have empathy with your customers talking to them as you would face-to-face and not in an automated, robotic manner. This empathy point is addressed nicely by Harvard Business Review who named and shamed 50 brands that scored the least on the empathy scale when it comes to Twitter. Just be careful when crafting a ‘cheeky chappy’ response that it doesn’t tip over into plain rude. 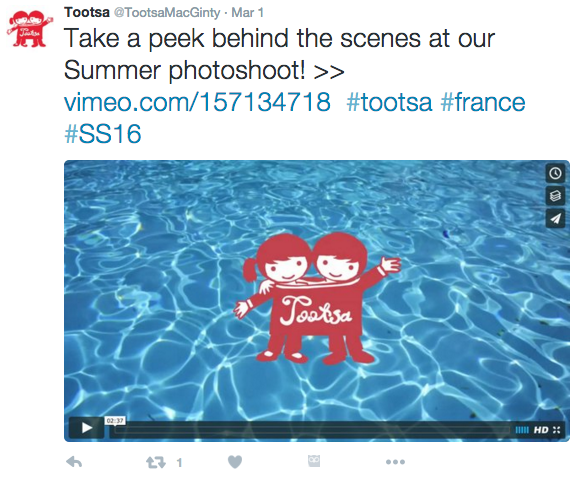 And last but not least, Tootsa MacGinty is another brand doing some hugely engaging things on Twitter. This fantastic company makes unisex kids clothes and consistently posts and retweets inspiring, current, comment-worthy content ranging from why we’re colour coding our kids and segmenting toys according to gender to behind-the-scenes videos from their new season’s photoshoot and general updates on what the founder is up to (usually with her daughter who inspired the business). Tootsa MacGinty is very generous when it comes to mentioning others too and posts regularly making sure content isn’t overwhelmed by too many hashtags. I’ve highlighted just a small number of businesses who are getting Twitter very right. HubSpot lists more in this great piece on ’10 outstanding Twitter feeds by B2B publishers’ if you’re interested in learning more. Good luck with your business Twittering and remember to have fun with them! It may take some time to find and get comfortable with your social media ‘voice’ but when you’ve found it, it’ll prove to be a great asset in this ever-connected digital, social world. 1. Get networking. Whichever city or town you’re in, the chances are there’ll be a whole world of business networking events you never knew existed that could prove excellent opportunities to make connections, meet people who are in similar situations as you, collect leads, learn about your industry, recruit talent etc. Whatever your agenda might be for attending these networking events, try not to go in all guns blazing. Instead, be approachable, friendly, genuine and open, making it your mission to connect people who can help each other and you. Being generous with your time and attention is a valued and, more importantly, memorable quality. Sites like findnetworkingevents.com can help you figure out what’s going on in your area. If you want to attend something more specific to your business, research what industry trade shows or sector specific networking events are being held in your region. Either get down to some old fashioned googling or why not take a peek at what events your competitors are attending? LinkedIn, websites of industry governing bodies as well as industry digital and print media are all great sources to help you uncover events specific to your business. 2. Create your own event. You might think creating your own event will blow the budget, but with some clever planning, it doesn’t have to. Why not ride on the back of an existing industry trade show or expo and capitalise on the fact that the people you need to speak to will, for a few precious days, all be in the same place, at the same time. Research which companies are attending by taking a look at the event website, hire a room in the exhibition hall and start organising meetings during those days to speak to your top priority prospects. If you really want to save the pennies, plan an online event or webinar. This has the advantage of being hugely convenient for those in attendance as it means there’s no tiresome, lengthy travel involved. Holding an engaging, fun, attention grabbing webinar that’s generous with information and isn’t a complete sales plug, will afford you a reputation as leader in your specialism and lets you build relationships with potential customers using a softer sales approach. Techsoup and Hubspot provide great guides for holding successful webinars and they’re both well worth a read before wading into the webinar waters. 3. Publish great content. Yes, I know I bang on about publishing great content a lot but you really can’t underestimate it and, if you write it yourself, it’s free! Comment-worthy and useful content published on your website, blog, social media channels etc drastically improves SEO, drives traffic, builds your reputation and generates good quality leads. Try writing top tips (like this! ), interviewing a leader in the industry or a professor who is an expert in your field. Sensible Marketing posted a blog of 44 B2B Content Marketing Ideas that’s guaranteed to get your content idea juices flowing. 4. Get LinkedIn. There’s a joke in our office about a particular Director ‘spreading it about a bit’ on LinkedIn. But as cringe-worthy as you might feel requesting to connect with someone, it’s worth doing for the potential business and for the connections further down the line you could make. If you find business networking awkward and staged then try going about it in a more sincere manner. Find groups talking about things you’re genuinely interested in and start sharing ideas and joining in discussions. Share your company’s great content and start building your brand. Don’t just login to LinkedIn, request to connect with your top 10 prospects and logout. Make this social channel more valuable by really investing some effort in it. You’ll certainly get more out of it and, again, it’s free! If you want to learn more, here’s a great post from 8waysin8days about Effective LinkedIn Strategies for B2B marketing. 5. And the award goes to…Do some digging into what industry or business awards you can put yourself up for. Even better, why not enter with an existing customer co-promoting an implementation or project you’ve worked on together? If you win you can capitalise on a load of publicity and promote your now award winning products via your website and social channels. If you place high enough but don’t actually win, you can still publicise your participation. 6. Get social. Twitter, Facebook, LinkedIn – they’re all free social media platforms that, if used well, can get you a ton of leads, help build your profile and improve communications with customers and industry peers. If you’re a small outfit and don’t have the time to dedicate to all three channels then just choose one but do it really well. If you want to hone your social media skills, I’d recommend The B2B Social Media Book by Bodnar and Cohen. It’s chock full of practical tips and offers good advice on analysing solid, quantitative metrics. 7. Warm up the PR machine. Advertising is costly and ROI is difficult to gauge when done through print media. So keep things cost effective by releasing something newsworthy. It’s free for journalists to write about you and you can feature in the same publications as you were going to pay to advertise in. The key word in this paragraph is newsworthy. No one wants to hear about small technology releases and updates or a new client deals unless you’re very big/they’re very big/the deal is worth a lot/it’s related to something very topical. If you have no newsworthy company or customer announcements why not conduct some good research and write an eBook packaging the results – results that provide valuable insights for your customers. This eBook on 31 PR Tactics That Make for Memorable Campaigns might spark some good ideas for newsworthy content. 8. Work your website. Successfulwebsites have evolved in recent years from essentially an online brochure shouting about your company, your products and your people to a hub of useful information and resources (as well as also promoting products and services). Hubspot founders Halligan and Shah realised that people want to be helped not sold to and sparked the inbound marketing movement whereby businesses can attract, engage and delight customers by providing relevant, helpful and personalised content. So if you really want your website to work for you and attract high volumes of good quality leads, you need to put content on your website that helps your customers. Take a look at Hubspot’s website, straight off the bat they’re offering a free report. Further down the page they promote their inbound community and a free tool to see how effective your website it. These assets get almost the same billing as the software platform Hubspot is selling. Take a leaf out of Hubspot’s book and transform your website from a bland, passive company brochure into a community hub, an industry resource, a bustling, thriving breeding ground for new ideas and a customer watering hole! 9. Ad promo credits. From time to time Facebook. LinkedIn, Google, Bing/Yahoo offer coupons so you can get a discount when buying advertising from them. Facebook has recently clamped down on these coupons in response to companies selling them on so they may be a little harder to find but coupons for Bing and Google are readily available and worth taking advantage of. 10. Free infographic templates. Did you know that 90% of information is transmitted to the brain visually and half of the brain is dedicated to visual function? This means that information presented graphically or visually is more likely to capture your target audience. This means that infographics can be one of your most powerful marketing assets. If the thought of getting creative with Photoshop or Illustrator is sending you into cold sweats, don’t worry! There are loads of free infographics templates online that’ll make your information, insights and research really shine. Here are a few to start you off: Venngage, Free Infographic Templates, Freepik. This certainly isn’t an exhaustive list, there are lots of low-cost or even free marketing resources that, thanks to the web, are easy to access and use. So go ahead and get marketing, just because you don’t have the budget doesn’t mean you can’t be hugely effective at cramming that pipeline full of leads! Trade shows gone wrong: are you getting the most out off your most costly marketing activity? It’s well accepted that trade shows are eye-wateringly expensive and highly stressful but also an important way to drive business and increase brand exposure. When done wrong, you haemorrhage money, waste time and potentially damage your company’s image in the process. When you’ve cracked it, you stand to win orders, gather a ton of good leads and give your company’s profile a boost with the people in the industry that matter. Pre-prepared order sheets and pricing strategy. Before you even get to the event make sure you and your team (especially the sales guys) know what your pricing and discount structure is per order quantity. There’s nothing worse than haggling with a determined customer only to find yourself back peddling or that you’ve made a loss at the end of the negotiation because you’re unfamiliar with the margins. Also, make things easy on yourself and bring pre-prepared order sheets either in hard copy or electronic form. That way orders won’t be scribbled down on an illegible piece of paper only to be dubiously translated post-event when memory of the details are fuzzy. Marketing materials that matter. Most delegates will walk away from an event with a sponsored bag filled with about 20 different companies’ brochures, data sheets, white papers, giveaway tat, snack wrappers and goodness knows what else. If you want people to read and remember your business, you need marketing materials that grab attention and stick out from the rest of the recycling! Keep your messaging short, sharp and take some inspiration from these unique and striking examples. Leads, leads, leads. One of, if not the main reason why businesses attend events is to capture leads in the hope that they might turn into an actual paying customer. Lead capture is a hugely important and, yes, slightly onerous task and can be done effectively a number of ways: stick them in a spreadsheet, use the scanners provided by the event organiser to scan people’s name badges, ask delegates to drop their business cards into a bowl in order to win a prize. Sometimes the organisers actually distribute attendee contact details but you may need to sponsor something at the event to enjoy this benefit. Sponsor something. If you have a little extra budget and the event has exactly the right calibre of people in attendance, get efficient and sponsor, say, a drinks reception for example. This way you can get your brand up front and centre and get some valuable networking done at the same time. Get cosy. Events are often held in very large, very impersonal conference centres with very little privacy to speak of. Unless you have a sizeable stand with its own meeting space, it might be worth hiring private meeting rooms within the conference centre to have somewhere less exposed to talk to bigger clients. Free tat. Instead of your giveaway being a throwaway, why not make it something delegates will keep, use and enjoy? There are a number of companies out there that do some interesting, original products, it may just involve a little extra research and thought. Here’s a good place to start though! Tell a story. If your products or solutions aren’t the most engaging or are quite dry, try and create a more relatable story around what you’re selling. How does it help the buyer? What problems does it solve for them? Sometimes it’s not what you buy but who you buy it from so if you have an interesting back story, use it! Provide some company background and inject some personality into what you do and why you’re doing it. Ooh pretty! Again, in a conference centre of sometimes hundreds of exhibitors, you need to stand out. People are like magpies, they tend to gravitate towards aesthetically pleasing, eye catching things regardless of whether they’re interested in what your selling or not. But once you’ve drawn them into your stand, that’s half the battle won! Make your exhibition space look as attractive as possible. Move away from a sparse pull-up banner or three – there are plenty of cheap and easy ways to dress a booth, you just need a bit of creative thinking. Here’s some food for thought. Be Social. Thanks to smartphones, tablets and free wifi, delegates are taking more photos at trade shows and posting more tweets and Facebook and LinkedIn updates than ever. Capitalise on this social behaviour and make sure you and your space look spectacular showing the passing traffic that your company has something to get social about. Get punchy with the PR. When media focus is already on an industry event, it’s a good time to release a story because the press are already primed. Industry press will always be in attendance so make sure you have a good press pack ready and you’ve put time aside to speak to journalists to either sell in your story or keep your company on their radar for the future if you have nothing newsworthy to sell at the time. There’s nothing wrong with building those relationships now for use later down the line. And that sums up my 10 tips for trade show success. As with most of these ‘tips & tricks’ blogs, it’s not an exhaustive list but gives you a little direction and somewhere to start when it comes to planning your attendance at an industry event. There’s a raft of things you can do as a small company to make your trade show budget stretch as far as it can (speaking opportunities etc) just make sure you’ve researched and planned far in advance and trade events may well turn out to be the secret to your company’s success. Twitter for business 101: Tweet? #what? “What is Twitter?” and “Should I be using it for my business?” are two questions that a couple of start-up owners have asked me recently in hushed, embarrassed tones. If you’re in the same boat then a) don’t be embarrassed, it takes 5 minutes to understand and b) the answer to the second question is, it depends. It’s an online social networking service that lets users send and read short, 140 character messages called ‘Tweets’. Why should a business use it? Increase sales – here are some examples of Twitter for business success stories. Why should I not use it? Like any social media channel, if you don’t have the time to dedicate to it (it doesn’t need to be a lot of time) then hold off until you can do it justice. The more thought and effort you put into it, the more successful you’ll be. If you’re only tweeting twice a year, nothing’s going to happen. If your customers aren’t on Twitter, it probably won’t be of much value to you. For example, if your target demographic is the OAP market, Twitter wouldn’t be the best channel to communicate with them. There may be a benefit for industry news or keeping an eye on competitors or channel partners but if you’re short on time, I’d concentrate on another, more effective form of communication. Twitter users use # (hashtags) to make it easier to search for topics of interest. For example, if I wanted to read messages about the new iPad Pro that’s just been released, I’d type #iPadPro in the search bar on Twitter. Any message that has used the #iPadPro hashtag will then appear. It’s your Twitter username. Mine is @AlmanacMktg. If you start a tweet with ‘@AlmanacMktg’ it’s a reply and will only be seen by the person you replied to and people who are following both of you. Nobody else will see it in their stream (although it will show up on your profile page and in Twitter search). If you use @AlmanacMktg anywhere but at the start of the tweet, it’s call a mention and I and everybody following you will see that message. It might look like this: ‘Just finalised my logo with @AlmanacMktg here it is’. You may choose both but Twitter is more spontaneous, less time consuming, has huge reach and anyone can search your Tweets. On Facebook your reach is only as far as the number of likes you have on your page (unless you go for paid advertising but that’s for another time). There is is, a quick guide to Twitter for business. If you think your company could benefit from social media but you need help figuring out where to start, get in touch, we’re always happy to help! It’s a new year and as you brush the festive leftovers off your novelty jumpers, it’s a perfect opportunity to cast a critical eye over your marketing plans to make sure you get what you need from them in 2016. Getting to grips with the big ticket marketing items such as social media strategy, events planning, website refresh, materials creation, lead generation campaigns and the like can be a bit daunting, especially when you’re emerging from a tinselly-mulled-wine haze. So, to keep it achievable, here are 3 simple, easy-to-commit-to actions that’ll see your marketing shine this year. All Aboard! I’m talking to you, Sales. Briefing everyone in the business about what’s happening on the marketing front just makes good sense. But it’s especially important to have regular, efficient catch-ups with your sales people. Getting Sales on-board with your marketing plans, activities and agreeing on what you need from each other from the start will make your job a lot easier. Good communication sets expectations; it’ll prime Sales to ask customers for quotes or case study information, to get valuable feedback, it’ll prepare them for campaigns and materials in the pipeline and allows you to create better tools for them. On that point, make sure you highlight how your marketing plans help them. Whether it’s better, shinier sales presentations, brochures or demos, improved training, stronger research, better lead capture and qualification etc. – highlight the marketing activities that will directly benefit the sales force. Create a short, sweet monthly or quarterly internal marketing newsletter aimed at Sales. This works well if your Sales guys work virtually. If a newsletter feels a bit overkill, a simple email with high level bullet updates of your activities, results and what’s coming up is quick and easy to author and digest. Have regular meetings with Sales either over the phone, Skype or physically in a room. It makes it easier to get information from them about the state of the market, the status of customers, whether there’s any news to promote or case studies to be written etc. It’s also a good opportunity to find out how you can help them e.g. moving a challenging sale forward, setting up demos, providing bespoke materials or market information etc. For larger businesses, it’s hugely beneficial to have a formal sales and marketing meeting at the start of the year. Get everyone in a room for the day and provide a full brief on what’s planned for the year in terms of product development, marketing and sales strategy. This gets everyone on the same page from the start. Say what? Listen to your customers. Then listen some more. It’s easy to do, the new year starts, you’re inundated with projects and everyone is demanding something from you. And somewhere in the chaos, you lose sight of one of voices drowning in the melee: your customer. Meetings. Whether they’re over the phone or in-person, listen to customers’ issues (be it budget, pricing, process issues etc.) and organise in your head how your products and solutions directly address those challenges for them. It’ll put you in a good place to use their words to either frame a response or influence your marketing materials or both. Customers’ customers. If you’re a B2B company selling B2C products or services, you have 2 sets of customers you need to listen to. Listen to what end-users as well as your customers are saying about your product or service. If you know the end-user, you’ll know what makes your customer tick when it comes to persuading them that you’re the right company for them. The Big Cheese(s): Listen to what’s happening with your customers at board level. At the end of the day, it’ll be the board that signs off any major purchase. If you’re only providing a small part of a bigger project, make sure you have a handle on the other pieces of the puzzle. Sometimes, manoeuvring other suppliers or providing expertise on the complete implementation will make the difference between getting the go ahead, delaying or even canning the project. Take note. Don’t just listen, document. This way you’ll see any patterns that emerge and you can feed it into your marketing materials, product development teams, Sales, and even the board for use at a strategic level. Variety is the spice of life. Give your content a good shake up. No one wants to read or see the same images or stagnant content month after month, year after year. So shake it up and try and have fun with what you publish! Website. Take another read of your webpages. Can you tweak them to sound punchier? Could your website’s images do with a refresh? As well as improving the reader’s experience, it’ll also help your Search Engine Optimisation (SEO) i.e. it’ll improve your chances of Google listing your website on the first few pages of a search result rather than, say, page 50. Blog. Finding it hard to come up with interesting topics to blog about? Try mixing up the content. Here are a few you could try: opinion pieces, infographics, first person experiences, interview an expert, top 5 lessons (like this! ), industry trends, a fan piece on an industry success story…give it a go! Social media. Pump life into your social media efforts by including more photos and interesting graphics. Photos generate a staggering 87% interaction rate from audiences so get snapping! Make things more personal and interesting by encouraging staff to get involved but make sure you brief them on some simple social media dos and don’ts before giving them the keys to the accounts! Videos. If your product or service is difficult to understand or too dry for brochure format, try a series of short, fun video interviews or explainer videos. Here are some great examples of some from Hubspot that are well worth a browse. Best of luck with your marketing endeavours this year and remember, it’s often when you get the simplest things right that you start seeing a positive difference to your marketing success! Baldrick, I have a cunning plan. Blackadder liked nothing more than a good, old fashioned, plan. And any business, whether you’re little or large needs one to get the best out of your marketing efforts. A good plan is the glue that holds together your marketing activities and campaigns, it’s a constant reminder for you to tell a consistent story across your various comms channels and lets you monitor progress in a methodical, meaningful way. So assuming all the initial market research, product development and set-up is done and you have something ready and waiting to be marketed, where do you start? Below I’ve outlined a few areas of marketing worth including in your plan. It’s by no means exhaustive but it’s somewhere to start. Who are my potential partners and sales channels? What industries, sub-industries or sectors am I selling to? Why would they want to buy my product/service over and above anyone else? What problems do my product/service solve for them? Would my sales and marketing activities have to change depending on what country I sold in? Now you know what the market conditions are like and who your key audiences are, it helps to create a simple statement explaining what your product is, how you’re positioning it in the market and the benefits on offer to that particular type of customer. It only needs to be a couple of sentences but remember to write like a human being. Try to avoid complex terms and business jargon. You may think it makes you sound more ‘corporate’ but a) that’s not a good thing and b) there’s nothing like a bit of ‘blue sky thinking,’ ‘moving the needle’ and ‘bleeding edge’ to turn your audience off faster than you can say ‘low hanging fruit’. If the buzzwords are getting in the way and you’re finding it difficult to craft your positioning statement – pretend you’re explaining it to your granny. It’s a good start! It may seem obvious but tailor your story for difference audiences. For example, if you’re a B2B company selling a mobile app to a Hotel for their guests to use, create a different message for the Hotel than for the Hotel guest. You might even break it down further and consider what the COO of the Hotel would want to know and would it be different from the CMO for example. When you’re done, you can use these messaging and positioning statements as a template from which all your other marketing materials (data sheets, brochures etc) can be created. You know your audience, you’ve honed your key messages so now, the fun stuff: creating content and designing some marketing materials! Whether it’s a business card, your website, a brochure, data sheet or case study – make sure you keep those key marketing messages at the front of your mind so you explain and promote your products and services in a consistent way. Continually look back at the different personas you’ve already identified and make sure each piece of content is written with them in mind. For example, if you’re selling tech to Hospitality, Travel and Entertainment companies, create separate sections for each industry on your website. The issues hotels have might be completely different from those of a cinema or stadium, for example. Look at creating great content before anything. Make it insightful, playful, interesting, entertaining or visual. Once the hard part of creating it is done, look at the different channels you can use to promote it; Twitter, Facebook, blog, press release, website etc. But remember to tailor it to the channel. What might work well for a blog won’t be appropriate for, say, a press release. You’ve put all this time, money and energy into market research, creating content, designing marketing materials and promoting, how do you know it’s all working? Measuring your marketing performance shows you the fruits of your labour. It tells you whether you’re on track to meet your goals or whether some campaign tweaking needs to be done. Reporting comes in all shapes and sizes and whatever marketing channels you use, it’ll have its own analytics functions. For example, Twitter, Facebook and LinkedIn all have their own reporting dashboard to show you how you’re doing and you can see your how your website is performing with Google Analytics. Achieve 10% increase in the rate at which people visit the website and are converted to buy. Increase traffic to website with blog referrals by 20% by the end of the quarter. Add £50k worth of new account business through marketing generated, qualified leads by the end of the year. There’s so much more that can be included in your plan but it really depends on what your marketing appetite is and whether you have the time and ability to do it justice. Whether you decide to do a little or a lot of marketing, it’s always best to have a plan because, unlike Blackadder and the long-suffering Baldrick, you’re far more likely to be successful! I’m not small. I’m concentrated awesome. Some smaller businesses feel that because of their size, they lack the marketing punch larger multinational organisations might command. You may not have the budget but your marketing can be just as effective, if not more so. I’ve worked for small companies and I’ve worked for large ones and what you might be lacking in funds, you can make up for in innovation, speed and agility. Agility: If there’s an unexpected change in the market or new legislation throws a spanner in your business plan then small companies can turn on a sixpence and market accordingly. It’s easier to get your house in order, prepare a statement, rework presentations and sales materials, update your website, brief staff etc in a company of, say, 20 than a company of thousands. Speed: This is related to agility and recognises that with fewer people in the mix, marketing doesn’t have to suffer the long, drawn-out process of multi-departmental sign-off and decision-making by committee. Small businesses can be quick off the mark and get that great marketing idea developed and out the door before competitors, reaping the rewards of first-mover advantage. Consistency: One area of marketing larger companies struggle with is maintaining a consistent message across all of their marketing channels and ensuring their many brand ambassadors (e.g. employees) stick to the script. You may have the perfect product, the best service and the most compelling unique selling point (USP) but if you don’t talk and write about it in a coherent, consistent way then it’s a moot point. The message is diluted and lost to your customers in the quagmire of competing voices. Innovation: Ever produced your best work under pressure? Necessity sometimes is the mother of invention and you might find that being a smaller company with limited marketing resources drives greater innovation. This might be a controversial one, but smaller companies can, in some ways, take bigger risks. It’s not so easy to take a risky marketing decision in a big company when you’re battling against ‘that’s the way we’ve always done it’ mentality and a long-standing conservative culture. And sometimes, the bigger the marketing risk, the bigger the revenue reward. Personality. Generally people follow people rather than faceless brands. People like to follow the CEO or head of sales of a company rather than a logo. If your brand has bags of personality then this might not be the case (take Nutella’s Facebook page as an example). As a start-up you’re effectively working with a blank canvas and can spend time honing a genuine corporate personality and tone of voice that you can use from the start vs. a more established business that might need to go through a costly, wider re-brand. So don’t write-off your marketing efforts just because you feel you can’t compete with the big boys. You can. And you can do it well, outmanoeuvring the clumsier corporations and quick-stepping your way to original, credible and, most importantly, profitable marketing success. Just to clarify, I’m not a sales person. But over the past few months, I’ve been subjected to and have witnessed a number of sales techniques that just can’t go on for everyone’s sanity and for the sake of winning any business. Too close, too creepy. This literally happened to me today. I downloaded an eBook from a marketing software company. 5 minutes after downloading it I had a missed call from them and a voicemail saying Richard wanted to speak to me. Out of curiosity, I googled the company and seconds later I received an email from Richard saying he’s left me a voicemail (I know) and he wanted to speak to me about my recent activity on his company’s website (I know this too. He told me as much in his voicemail). He then sent me a screenshot of his website analytics showing me the ebook I downloaded, what pages I visited and how long I had spent on each page! Stalk much? Richard, you’re too keen. I’ve not even had enough time to open, let alone read the ebook. A call, a voicemail and an email all within 10 minutes? Go away Richard. Go away. Also, don’t show me a screenshot of my online activity from your website. Use it for your own information, don’t show me what I’ve been doing. I’ve been doing it, so I know already! It’s just creepy and weird. It makes me think you’re sitting there in a darkened room watching what I’m doing, what I’m typing and where I’m clicking. Put the binoculars down Richard. Put them down. In the words of Edna Mode, “Luck favours the prepared, dahliing”. I’m sure this is one of the first things they teach in sales training but make sure you really get to know your potential customer and you’re fully prepared before going to a meeting, emailing or calling them. I recently accompanied a sales guy into a meeting with a big potential customer and almost before the introductions were done, he just leapt straight in there, all guns blazing, with the sales pitch. It turns out the customer already had the tech (which a quick look on their website would have confirmed). The fact they had an existing solution wasn’t the point – if the sales guy had prior knowledge of that, he could have talked about why his product was better, reasons for switching, finding out if the client was happy with the tech or if they were experiencing any problems with it etc. Because he wasn’t prepared, he didn’t position the pitch like that and it looked like he hadn’t done his research. Which he hadn’t. Two ears, one mouth. Sales should use them in that ratio. The best sales people I have seen working their magic ask a huge amount of open questions, listening more than blindly pitching. They somehow get the customer to talk themselves into buying rather than throwing facts and stats at them hoping something will stick. If you really listen to your customer (not just feign listening, thinking you know it already) then you’ll have the knowledge to pitch your product or service in the strongest way possible. For example, if a customer is saying that they have issues with the high cost of operations, focus on how your product makes their processes more efficient. If your customer says their biggest challenge is loyalty, focus on how you can help drive repeat business. The anti-Richard. Creepy Richard may have been too keen but then you have the other end of the scale where a whole pool of good leads exist but Sales never follow up on them. The one situation where I see this happening the most is right after an event. The company has put in the blood, sweat and tears to pull off a successful trade show, they’ve collected a ton of qualified leads and then they just sit there, languishing as a stack of business cards or a forgotten spreadsheet, never to be nurtured into a fully fledged customer. Instead of over-zealous, hard sell or an ill-prepared sales rant or even post-event lead amnesia, try and look at the sales process as solving a problem for a customer in a way that is most beneficial to them. It may be counterintuitive but that includes being honest with them and admitting your solution may not be the best thing for their business. I’m not saying sabotage your sale but if a customer buys something that isn’t suitable and they know you’ve just sold it to them to get commission then it’ll hurt you more in the long run. They’ll never use you again. THOSE Christmas ads: Take away more than just a warm and fuzzy feeling – there’s marketing gold too! It’s that time of year again and it’s been that time of year since September. It was still a balmy 25 degrees outside and Christmas trees started materialising all over the high street as a stark reminder of the chaos that’s soon to be/already upon us. For me, I don’t get the first festive pang until I’ve seen the John Lewis Christmas advert (and its often hilarious parodies, but that’s for another time). Even though I’d rather chew my own foot off than claw my way through frenetic shoppers in the confines of a Christmas-on-steroids department store, John Lewis still somehow manages to bring a little merry cheer to our mildly bah humbug household. Over the years, they’ve produced some brilliant Christmas ads. They may be on a par with Spectre to make but, the feel-good stories they’ve lovingly created have definitely been memorable. If you want to apply some of the John Lewis magic to marketing your own business, here are some of the reasons why these ads have made such an impact. Never underestimate that feel-good factor. The Bear and the Hare is all about Hare’s love for his friend: Bear (who’s never seen Christmas as he’s always hibernating), and wanting to share the delights of Christmas day with him. The Journey is all about the dedication of Snowman to Snow-woman and going that extra mile to find her the perfect present. Adverts and marketing campaigns that promote and evoke very tangible, vivid, positive emotions rarely go wrong (unless they’re insincere or massively cheesy). For example, Facebook’s adverts are all about the strong ties of friendship, connecting people, and re-connecting people that might have drifted apart. The hungryhouse ad is all about socialising and spending time eating with flatmates. The Evian baby ads are all about getting in touch with your younger self – they’re also playful and funny. Not every piece of promotional material needs to leave your reader with that feel-good feeling but when you’re telling your customers about your brand, you need to find that human aspect and bring it to life using it as a frame of reference. The Long Wait ad sums this one up nicely. Anyone who has a kid or remembers being one knows the anticipation and excitement that builds up during the 24 days to C-day. The twist at the end of this ad is that we think the little boy is excited to open his presents but actually he’s been going stir crazy wanting to give a present. Twist aside, the point is, make your marketing relatable. What are the actual benefits of someone buying your service or product? If it’s very technical, break it down to its simplest benefit like NCR did nicely in its 2013 rebrand. If I said to you, “NCR provides industry-leading, self-service solutions that optimise the customer experience, increase revenues and drives efficiency across multiple industries,” you probably wouldn’t care less. If I said, “NCR sells ultramodern tech that you use every day to make life easier,” you’d probably be able to relate to that a bit more. (Incidentally, NCR’s tech portfolio includes things like smart ATM machines, self-service airport check-in kiosks, supermarket self-service check-out kiosks, mobile apps, mobile order and payment, digital navigation and more). NCR is a B2B company but its whole message is around ‘Everyday made easier’ – not just for the end consumer, but also for businesses and employees. They’ve taken what is traditionally dry-as-a-bone subject matter and given it a relatable, human face: you use our tech every day, you don’t need an IT degree to understand it, it’s simple: our technology makes everyday easier. All good marketers are great storytellers. And if there’s one thing that ties all of John Lewis’ Christmas ads together it’s that they all tell a great, yet simple, story. This year’s Man on the Moon ad tells a tale of a little girl who, using her telescope, spots a lonely old man living on the moon. Throughout the year she watches him live his sad, lonely existence. On Christmas day you think she’s forgotten about him as she has a merry time with her family but lo and behold, he spots some balloons attached to a parcel. It’s a telescope that he uses to finally see the little girl who is looking right back at him. She smiles at him and it brings a tear to his eye. The tagline is: Show someone they’re loved this Christmas. It’s a simple, touching, powerful story and John Lewis seems to forego promoting any of their actual products (I’m not even sure they sell telescopes). But the first time I saw it, I knew it was their advert before their logo popped up at the end. And you know every year they’ll weave a good story that people will be talking about and making parodies of, which only serves to increase their exposure even more. So there you have it, 3 things you can take away from the John Lewis ads this festive season other than the anxiety of the shopping itself. Happy holidays!